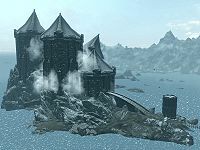 Castle Volkihar is an ancient castle perhaps dating back to the Merethic Era or the early First Era. It is located on an isolated island off the coast of Haafingar Hold in Skyrim, near the border with High Rock. Historically, it served as the home of Lord Harkon. In life, Harkon was a very rich ruler of the lands who feared mortality. In return for sacrificing thousands of innocents, Molag Bal granted Harkon—as well as his wife Valerica and his daughter Serana—the gift of vampirism. As pure-blooded Vampire Lords, Harkon and his family had immense vampiric powers. Harkon became obsessed with a prophecy he discovered from the Elder Scrolls, which foretold of a day when the sun would be darkened and vampires would rule Tamriel. His estranged wife, Valerica, sought to stop his maddened search. She did this by hiding Serana and an Elder Scroll in Dimhollow Crypt, and creating a portal to the Soul Cairn in Castle Volkihar. Valerica fled to the realm with a second Elder Scroll, but was imprisoned there by the Ideal Masters. Harkon, in a fit of rage, destroyed and abandoned parts of the castle which reminded him of his wife, such as the courtyard. Harkon created the Volkihar bloodline, and formed a court based in Castle Volkihar keep. For several eras, he scoured the lands in vain for his lost wife and child, becomingly increasingly consumed by the prophecy. The vampires of Castle Volkihar remained the dominant vampiric faction in Skyrim by culling feral vampires in the province, even those of their own bloodline. The island became infamous among sailors, who believed it to be cursed. Undead Bone Hawks inhabited the island; other monsters such as Gargoyles and Death Hounds were kept in the company of the vampires, within the castle. In 4E 201, the Volkihar vampires grew more bold, attacking major cities and destroying the Skyrim branch of the Vigilants of Stendarr. In response to this, an ancient order of vampire hunters named the Dawnguard was refounded. Serana was awoken by the Last Dragonborn, who had been sent to Dimhollow Crypt by the Dawnguard; the two then journeyed to Castle Volkihar at her request. The prophecy was realized when the two freed Valerica from the Soul Cairn and discovered how Auriel's Bow could be corrupted to temporarily block the sun. Lord Harkon was then defeated with the bow, although it is unknown if the Dragonborn took his place as leader of the Volkihar, or destroyed the court. Following her husband's demise, Valerica returned to Castle Volkihar, and repairs were made to the castle. This page was last modified on 31 January 2015, at 18:13.